This is one of my favorite poems. I came across it as a child and I've carried it around with me in the back of my mind wherever I go. "I feel that this is right for me, I know that this is wrong." That's something I've been thinking about a lot today. For the past couple of days, really. What's right for me. Some things are right for everybody. Being nice. Giving thanks. A good belly laugh. And some things are wrong for everyone. Killing people. Gossiping. Eating too many cookies. But there are a lot of little things, personal things, that may be right for one person and wrong for another. Case in point: blogs. I've known many a wonderful blogger over the years who have eventually walked away from their blogs for a variety of reasons. It may be that it takes up too much of their time or even simply that they've lost interest. I miss those blogs, but I understand where those bloggers were coming from when they made their decision to walk away. And quite often enough I've thought long and hard about my blog. Is this really the best way I could be spending my time? Is this right for me? For so many of my friends--online and in my neighborhood--the answer is a clear and imposing no. Blogging isn't right for them. Maybe just not in this season of their lives, maybe not ever. But for me, over and over again, the answer about whether blogging is right for me, if it's worth the time I spend on it, is a calm and peaceful yes. I need the time to write, to think, and to share. I need your collaboration and support. And every once in a while I have the opportunity to share things that really will make a difference in someone else's life. And that is a blessing indeed. There's always a but. Because, just like in the poem, we often know when things are wrong for us, but sometimes only feel that things are right. And, despite getting the same answer over and over again that this is what I'm supposed to be doing, I still tend to carry around with me that little bit of doubt. After all, I could be cleaning my house. Playing with my daughter. Visiting my neighbors. Preparing and making meals. And those are all very good and important things. Things that I don't always give my all when I'm sewing and crafting and taking pictures and writing blog posts. I was talking to a friend today who shared how torn she feels between wanting to feel like a "good" mom and needing to have other outlets for her own creativity and undeniable self. We had never met until this evening, but as she talked about her struggle, I knew exactly how she felt. Motherhood is wonderful and taxing, but, at least for me, it's hard to feel truly fulfilled if I never do the things that make my heart sing. I know of no woman--or person, for that matter--who can spend their whole day at work or at home with kids or at school doing assigned work and then feel truly, entirely fulfilled by doing just that. We all need something that belongs to us. For one of my friends it's a book group. For another it's having time to run. Other friends are lit up inside by web design and writing novels. Scrapbooking, crafting, playing the guitar, sewing, reading, organizing, baking. And of course you can involve little children in some of these things, but not in the way that's deeply fulfilling to one's soul. We need me-time. Or, in some cases, just time with grown-ups who like to do the things we like to do. And that does not make us bad people, bad mothers. It means we have talents and a desire to use them. It means we want to grow. We know even before we have a child in our arms that mothering is selfless work. And so, from the moment that first child enters our life, there is hardly a guilt-free moment. Because, really, parenting is selfless work done by selfish, imperfect people. Of course we love our children. Of course we'd take a bullet for them. But that doesn't mean we don't also want to sneak out while our husband's studying so we can have girl time. Or just me time. It doesn't mean we don't want time to pee uninterrupted. Or that we really always want to sit and read books with our kids. We do read books with our kids (over and over and over again). And we do endure the constant jabber (or whining... or tantrums) until we have a headache. And we do fold the laundry and wash the dishes and color pictures and drive them to and from school and help get their shoes on the right feet and cuddle them up before they go to bed. We do these things even when we'd rather be doing other things. But the fact remains that, often, we'd rather be doing other things. And so we walk around with a cloud of guilt that will never settle. 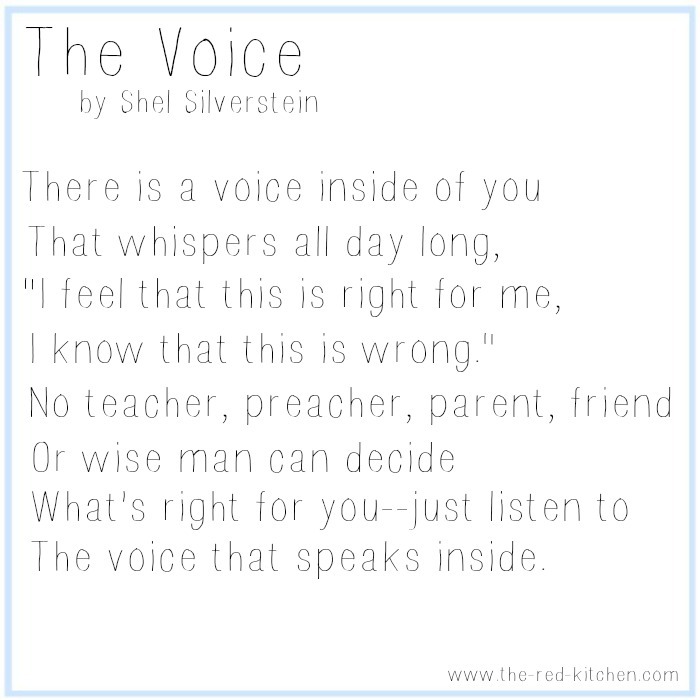 Did you know that there are two voices? One of them whispers encouragement, helps us know what's good and bad, and fills us up with joy. The one one knows only one simple phrase: "You're doing it wrong!" And despite our good efforts, all too often it's the second voice we hear. The first one is busy telling us that we're beautiful and loving and worthwhile. And the other one is pointing out the strengths in others that happen to be our weaknesses and telling us over and over again, "You're doing it wrong!" And we listen. Because we know we're not perfect. And that hurts. Which, by the way, is all the second voice ever wants us to feel. But don't you listen to it. You're right might not look the same as somebody else's. Your right might look like a messy house and a finished blog post. Or a clean house and a neglected garden. Or a happy child and an overflowing inbox. It might look like dinner on the table... or a night for ordering pizza. It might look like making the personal sacrifice to go back to work even though you'd really rather stay home with your kids. Or spending your evenings finishing a school program instead of relaxing like you used to. What's right for you hardly ever looks exactly the same as what's right for somebody else. We all have different needs, different lives and schedules, different talents. It's supposed to be that way. In the townhouse where we live the floor plan for all 40 or 50 townhouses is exactly the same. We're friends with several of our neighbors, so I've visited their houses many times. We joke about how amazing it is that we can walk into someone else's house--someone who's house looks exactly like ours on the bare bones--and see instantly how different it is. Each house reflects the different personalities and lifestyles of the families who live there. And I'm always impressed by the beauty in each one. Our lives and what's right for each of us is, just like our homes, beautifully different. And that is exactly the way it's supposed to be. Have the wisdom and the courage to find out what your right looks like and stick to it. When you do, I promise you'll be happy. Katie THANK YOU for this post. It spoke to my heart in so many ways. I always wonder if something is right for me when I feel it is but so many around me find that it isn't right for them. Your post has given me courage to go forward with things that I know deep down are right for me. As always, I love your thought provoking posts! "...parenting is selfless work done by selfish, imperfect people" - so true, so true. Love this post. Love you.